Roasted Garlic Cheesy Cauliflower – This Girl Loves to Eat! I bought a couple of heads of cauliflower at the farmer’s market, but wasn’t excited to serve it steamed with cheese, as make-believe rice, wannabe mashed potatoes, or even spiced up and roasted whole. A trip to Trader Joe’s later, I had some inspiration for a main dish casserole I could serve with a salad. Later this week it will be a great side dish for smoked sausage or, if I’m feeling inspired, Roasted Frenched Pork Chops. In heavy saucepan squeeze the roasted garlic and shallots out of their skins and add 3 TBLS butter. Cook over medium heat until butter melts. Using a fork or an immersion blender stir/blend until the garlic and shallots are crushed and well combined. Add a generous amount of pepper, the cream (or 1/2 & 1/2) and bring just to a boil. Combine the last 1 TBLS of butter (melted) with 2 TBLS of the Gluten Free flour (all purpose if GF isn’t a concern for you) and blend or whisk into the mixture in the pan until the mixture begins to thicken. Add the cream cheese then 1 Cup of the pepper jack and 1 Cup of the gouda, stirring constantly until melted. It may not be a flowing sauce, but resemble a big melted blob – that’s ok. Remove from heat and pour into the cauliflower mixture in a large bowl. Use a large rubber spatula to stir together until well mixed. Spread into prepared 9 x 13 pan, sprinkle remaining bacon, green onion and cheeses over the top, cover loosely with foil and bake for 30 minutes; remove foil and continue to bake until cheese is brown and bubbly. 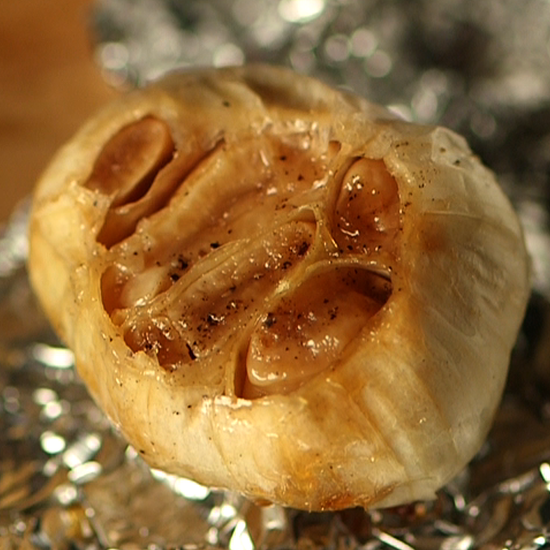 Remove from oven and let cool 5-10 minutes. I serve with a bottle of Frank’s Red Hot for those who like more spice. 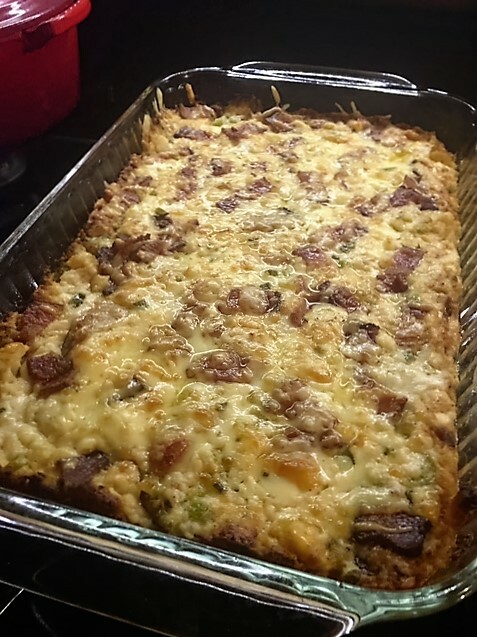 Posted on November 5, 2015 November 5, 2015 by ls1228Posted in Gluten Free, Main Dish, Recipes, Side Dish, vegetarian optionTagged aged gouda, bacon, cauliflower, farmer's market, ham, pepper jack, roasted garlic, roasted garlic cheesy cauliflower, Trader Joe's.